I am Sharon Khisa 13 years old in class seven at Seritanyi primary school. At my age, I should have been in high school by now. However, because of the way things are at home and the lack of money to pay my school supplies fees, I can only attend school part time. My mother is single and does all she can to make ends meet but there is never enough. Even though she works part time for people in our area doing some casual work she can’t support a child in school. She became a single mother after the death of my father who passed away in a car accident. Even though she does all she can trying to feed her 5 children, at times, things seems difficult for her so none of her children are going to school except me. If I can do well in school, I could become a pilot. However, for now my life seems hopeless because the mother is striving to provide food and the school fees for me to go to school full time. However, she can’t afford all of these things now. I would be happy if someone who can support me and help to fulfill my dream. I like coming to the house of the lord to sing and praise the almighty father. Please send me an introductory letter to letters@ccikids.org and I will be sure to write back to you. You can write to me as often as you wish and that way we will really develop a relationship. 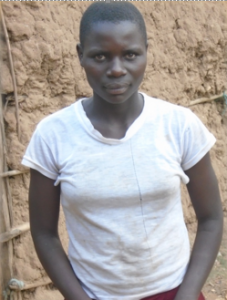 When you sponsor a child like Sharon Khisa, you not only help this individual child. But helping Sharon also helps his community. We are building a self-sufficient, eco-friendly Children’s Village. Part of your donation will go towards building schools and houses so that Sharon can have a brighter future. Here is how you can sponsor Sharon.